One of my favorite movies of all time is Rollerball, the story of one man that is being forced to retire from the game he loves, and the corporations want him out by any means necessary. If you haven't seen it, you need to pick it up (and not the crappy remake staring Paul Heyman.) Anyways, I've recently been working with some Rollerball pieces and I made these Rollerball sigs. Althought there were +20 teams in Rollerball, we only saw 4 teams play. I've made sigs for those 4, in the order we see them in the movie. C&C welcome. Nice work! 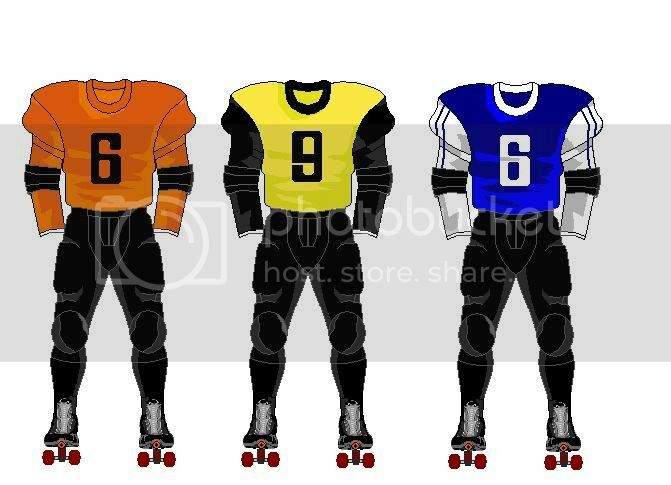 It looks like something one might see on "the official Rollerball website" if such a thing existed. Did the Rollerball teams have nicknames and logos too? If not, perhaps we should come up with a few. In addition to Houston, Tokyo, Madrid, and New York, some of the other "rollerball cities" mentioned in the movie: Madrid, Manila, Rome, Pittsburgh. I remember watching the remake a couple of years back and thinking it was utter trash. I haven't seen much more than a few minutes of footage from the original w/ James Caan, but it least that looked more like an organized sport. No, the teams were only known by their city and what corporation they were a part of. Houston was the head of the Energy Corporation, Tokyo was the head of the Luxury Corporation, etc. 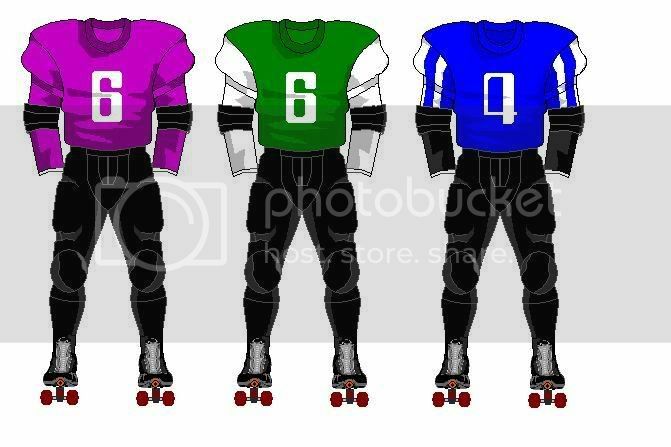 Each team had their own unique colors and helmet pattern, but shared the same templates for everything else. And yes, Manila, Rome, and Pittsburgh were the other cities mentioned. I have been a 1975 Rollerball fan since day one. the remake was a joke. I found some photos to update your SIG's they are good but could be GREAT. "No, the teams were only known by their city and what corporation they were a part of. Houston was the head of the Energy Corporation, Tokyo was the head of the Luxury Corporation, etc." Houston Energy Corporation? You mean Enron owns the team in the future? Tokyo Luxury Corporation? Sony rules Japan? Maybe the idea of corporations taking over the world isn't so far fetched. But I'm not sure I'd want to see corporate logos on the uniforms or helmets. 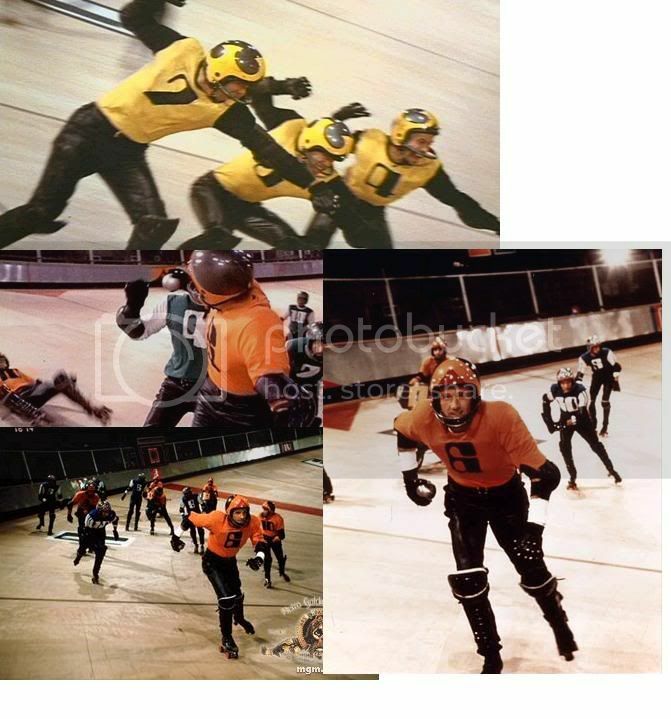 I wish I could find this online now... but a couple years back, on some random site, the press kit materials for Rollerball were posted in their entirety, and they were very intriguing and thorough. Added a lot to the backstory. Cities around the world were designated centers of various types of industry, since basically all corporations had merged together into one all-powerful entity. I remember that there was also a Chicago team, because Chicago was the designated center for Agriculture. And I could swear there were nicknames for the teams... I want to say Tokyo's was something bee-related, and thus the yellow unis. Oh, and one other interesting tidbit: the arena for Rollerball was in Munich, Germany. It was the same arena used for basketball in the 1972 Olympics. I spotted it the first time I watched the film because of the shots of its scoreboard... a memorable one for anyone who's seen highlights of the USA-USSR gold medal debacle. No no no. In the future world, there were 6 major corporations: Energy, Food, Transport, Luxury, and Housing. Each corpotation has one head city and several regular cities. So where's the Rollerball template? I think its kinda funny that the "futuristic" looks of the 50s/60s/70s have become now directly associated as looks from those eras as opposed to their ideas of the future. If I see a font like the font you used in your sigs, I automatically think 1970's. Not 70's futuristic. Or the "future cars" that you'd see in the 50s. If I see one of those I go "Ah, that's 50 design" not "That's what they thought we'd have now in the 50s!" Anyway, rollerball is a movie I've seen bits and pieces of, but like the other 100s of movies I need to see, it probably will be forgotten about the next time I'm at Blockbuster for the newest stupid comedy. The Purple team Didnt make it to movie as a "real" Game. They were on the highlight reel at the party. Purple never was given a name. Alright! We have a Rollerball template--now to figure out how to turn it into a fantasy league! I'm making a roller ball simulation at the moment. The info here was awesome thank you.. In the future, please don't bump up a topic that's 11 years old.